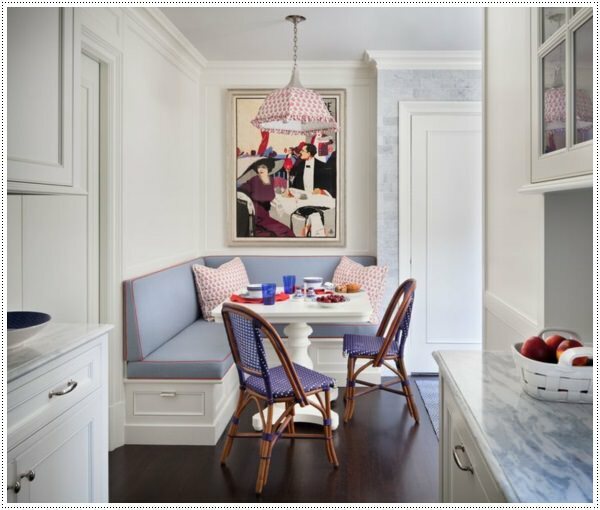 If you happen to value that element of having your breakfast in a cozy place, with a pleasant and relaxed atmosphere, a place where you can enjoy intimate family time then a well-designed breakfast nook is ideal for you. 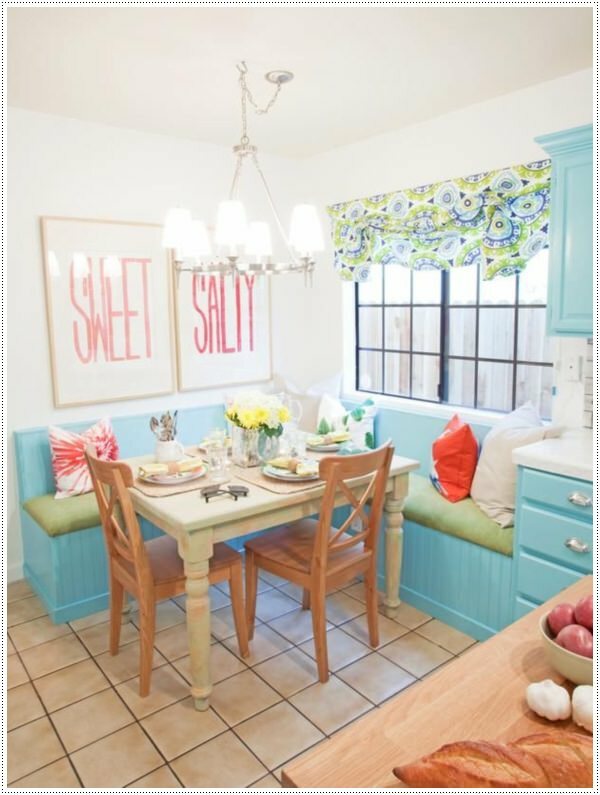 You can design your own breakfast nook or make use of the brilliant breakfast nook ideas shared here for a more relaxing breakfast time. 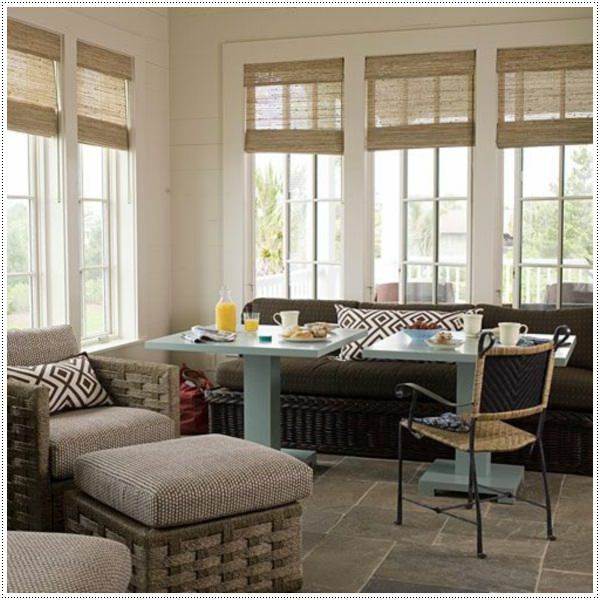 The breakfast nook also enhances the overall outlook of the home resulting into a more luxurious home. While it should be practical for everyday use, it should also be comfortable, appealing to the eye, and inviting to guests. Those are a lot of factors to take into consideration, but we’re here to help. 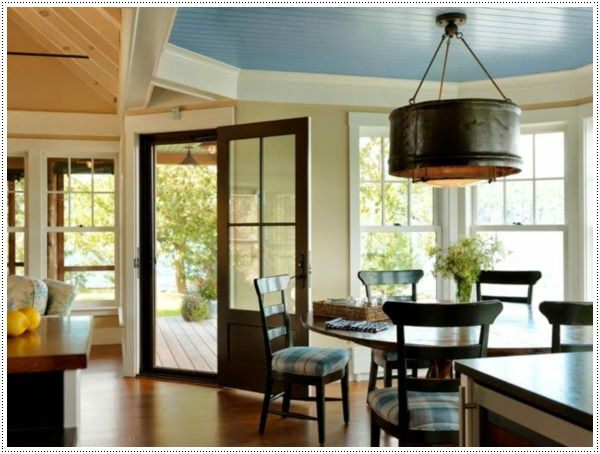 These twenty brilliant designs are guaranteed to help inspire and motivate you to design the best breakfast nook for your home, lifestyle, and personal taste. 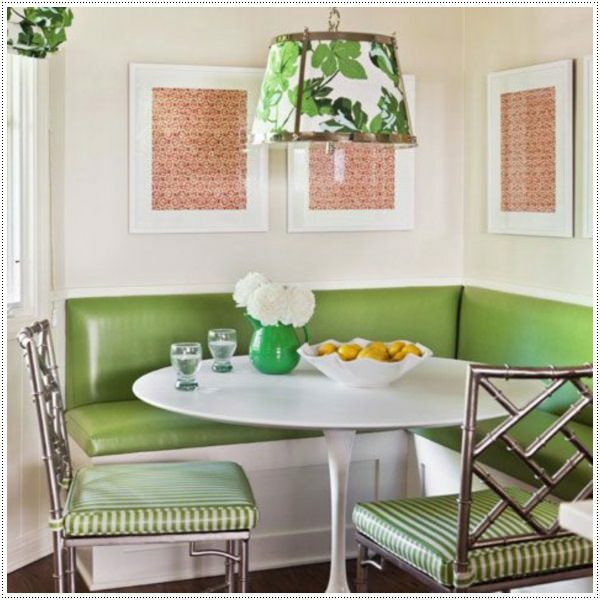 This retro-inspired breakfast nook looks as though it would have come straight from an episode of the classic 50’s television show Happy Days. Minus a cute waitress and a stack of hotcakes, this design includes everything you would find in a small town diner. 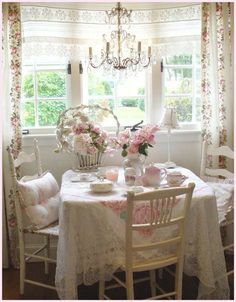 With table linens and valances made of dainty lace, an ornate chandelier, antique whitewashed furniture, and roses everywhere, this breakfast nook oozes with femininity. Classic benches made of medium-toned wood, paired with a plain granite countertop, create an ideal design for those with a simple sense of style. 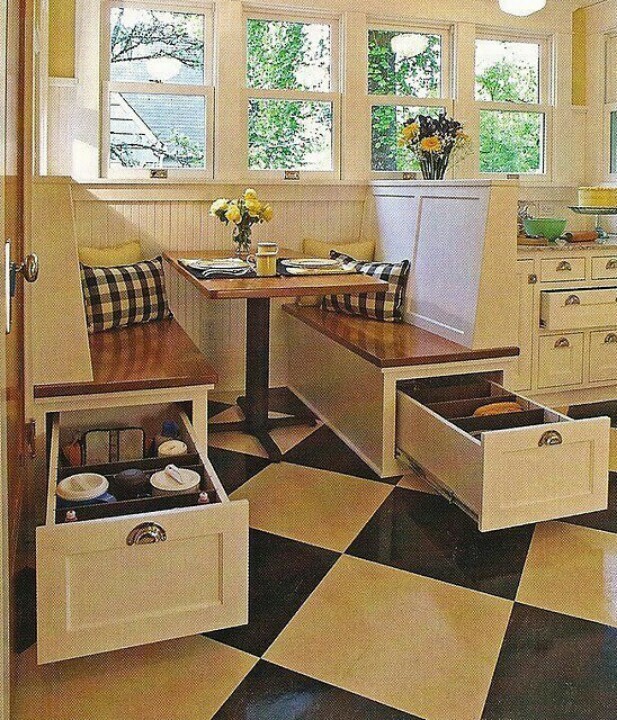 Make the most of limited space by installing benches with pullout drawers underneath, perfect for storing pots and pans, table linens, or any other odds and ends that won’t fit into your kitchen cabinets. 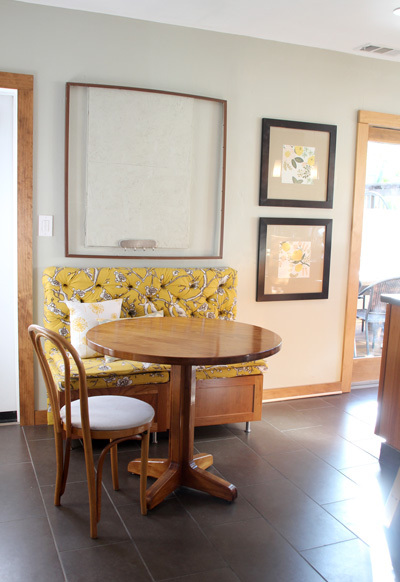 Installing benches that also act as storage chests is another innovative and discreet way to make the most of space in your breakfast nook while maintaining an appearance that’s appealing to the eye. The plush sofa seating and abundance of “leg room” in this room’s design make it not only a great place for eating breakfast but also a wonderful location for lounging or reading a good book. 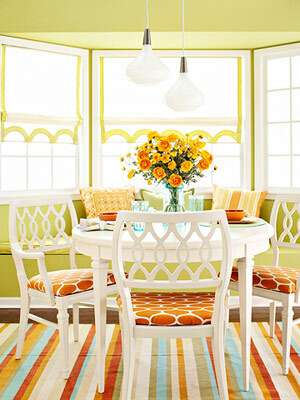 With the right décor, a breakfast nook can be just as cozy and family-friendly as a TV room or bedroom. Fill the walls of your space with framed drawings created by your favorite little artists, and line the upper wall with shelving that displays their portraits. 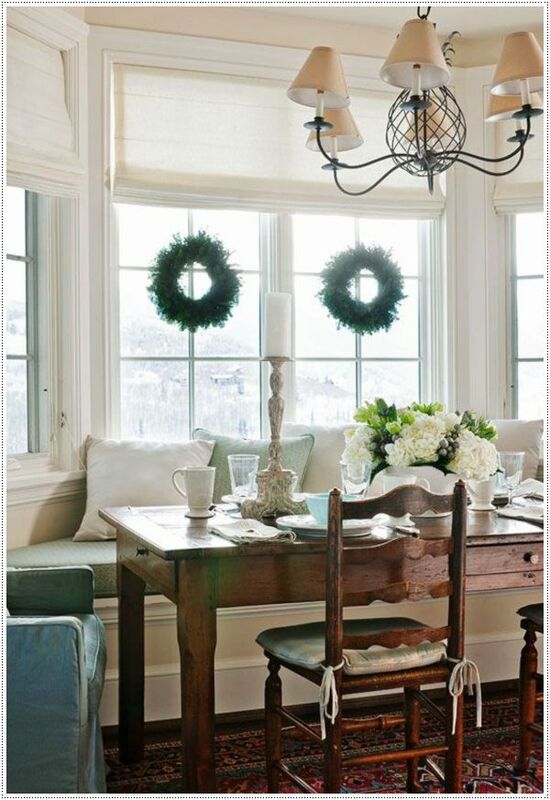 Most people want a breakfast nook with an ambiance that’s clean, fresh, and full of light. 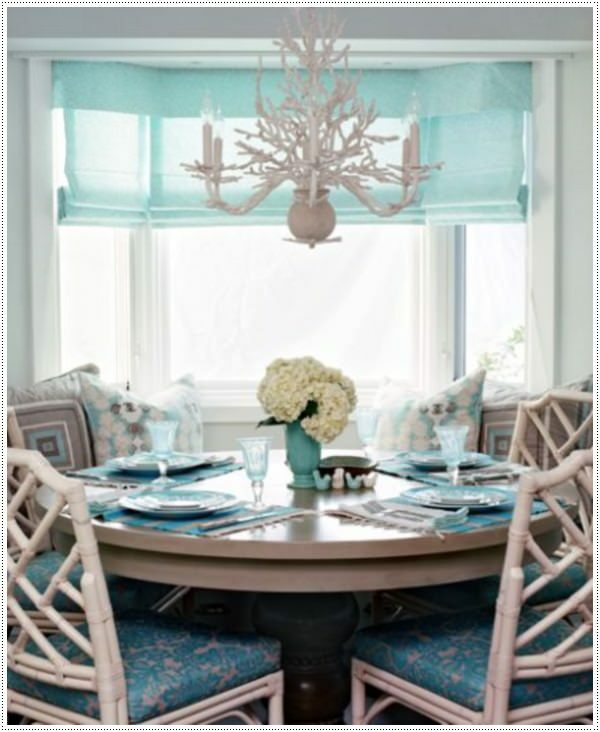 Outfitting your dining space with whitewashed walls and furniture is a fantastic way to create such a feeling, while cushions, pillows, and flowers in bright hues like teal add a burst of bold color to the room. 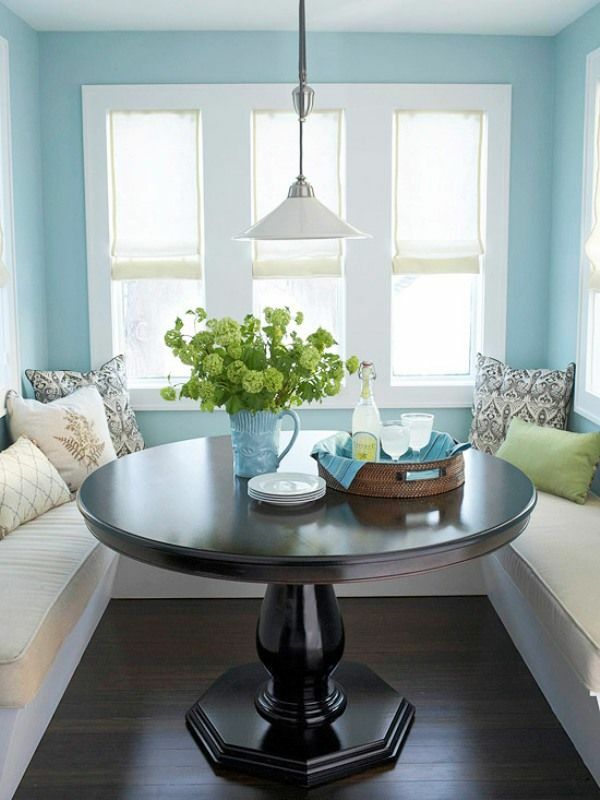 For a different take on the white and color contrast, slick your walls in a bright shade (like this electric blue) and pair with a whitewashed booth, table, and wood wall panels. Your family may be more interested in watching the morning news on television than peering through a window at the great outdoors as they eat breakfast. If so, this design is ideal for your crew, with a television mounted above the table and beautifully surrounded by decorative plates. 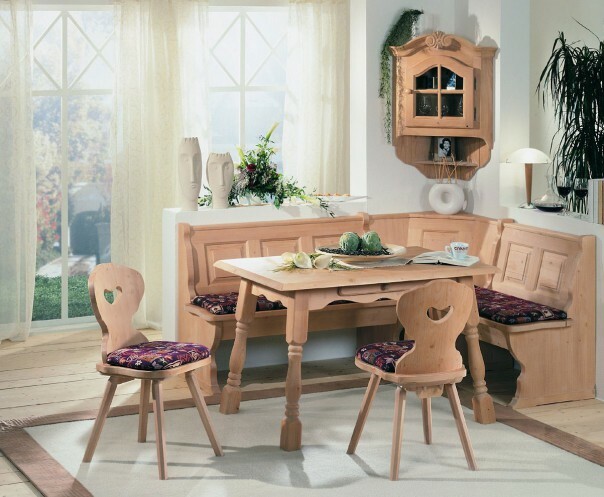 If you’re having a difficult time deciding whether to install a booth or use a traditional table to enjoy your morning meal, why not experience the best of both worlds? 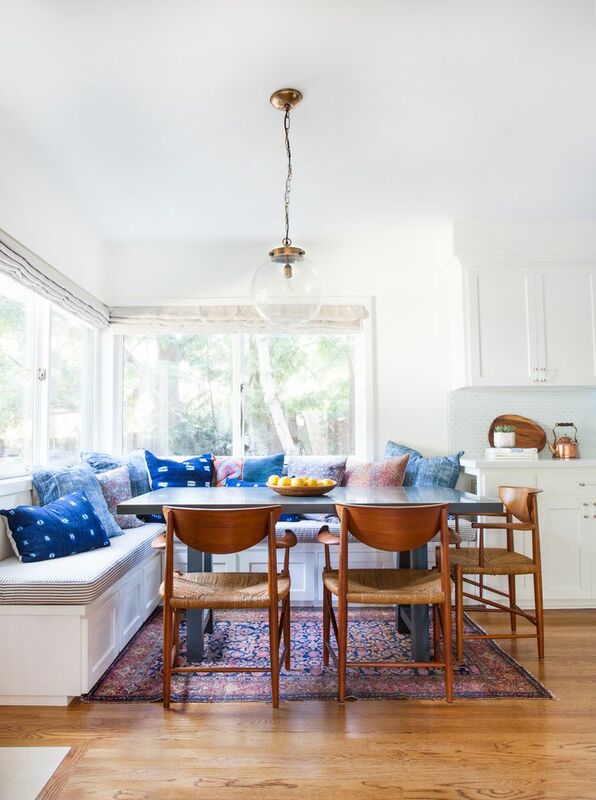 We love how Morgan of Pepper Design Blog incorporated a little bit of both designs into her family’s lovely breakfast nook. 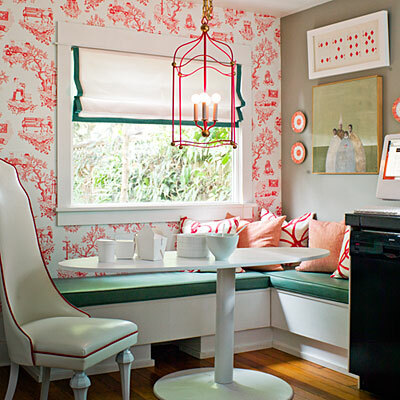 Just one playfully wallpapered wall will add a pop of pizazz to an otherwise simplistic breakfast nook setup. We adore the way the red and white design of this wallpaper plays against the neutral and green tones that are otherwise present in the room. 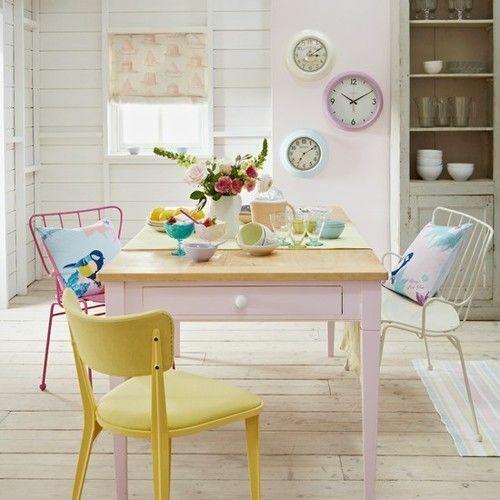 This room is color-coordinated without becoming overwhelmingly matched. 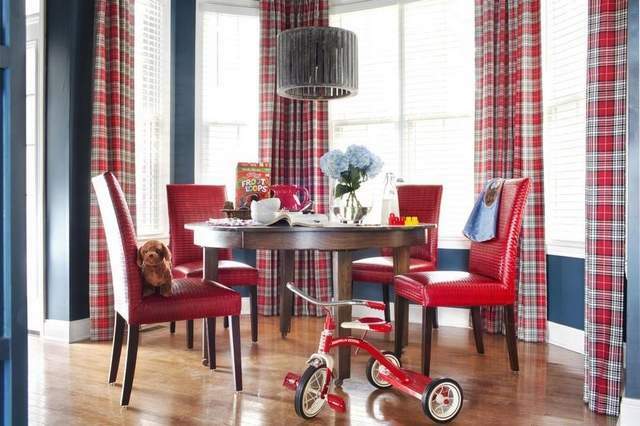 The shade of red present on the chairs and curtains is identical, but the differing materials and patterns contrast in a complimentary way. 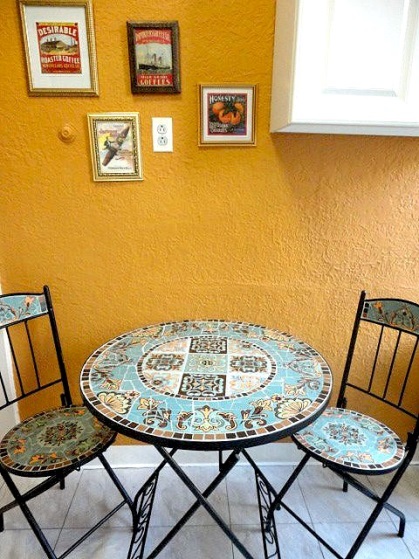 With bright walls and outdoor patio furniture, your breakfast nook can feel as though it’s sitting outside of a Spanish café instead of in your suburban home. 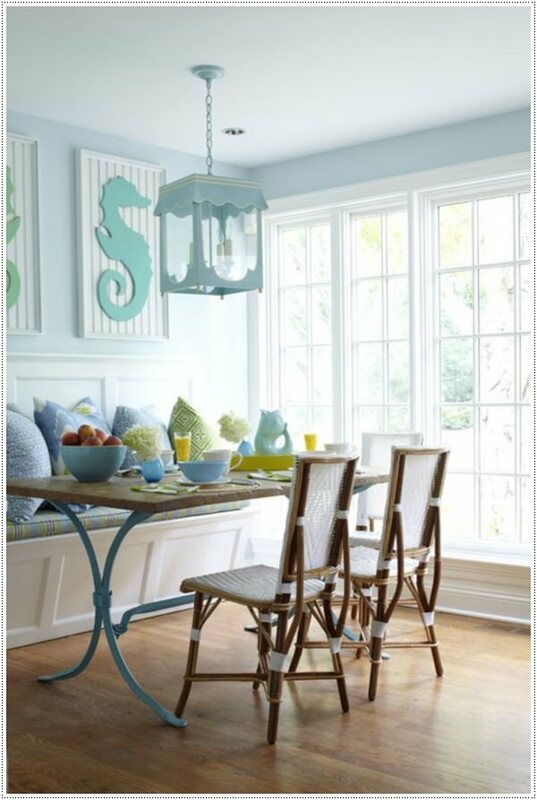 Spending a morning in this breakfast nook with a strong cup of coffee is sure to make you feel like you’re walking on sunshine! While the ikat-patterned couch sublimely coordinates with the gray and yellow color palette of the entire room, the unique aesthetic of the bar stools add a fun sense of contrast. 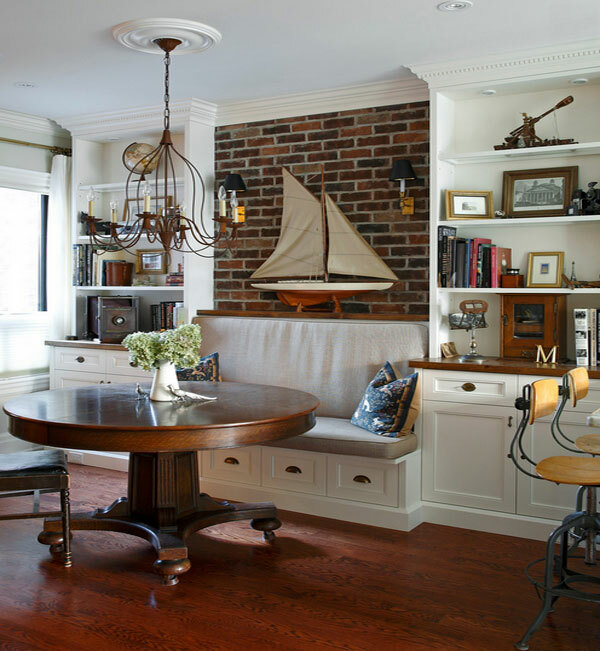 This lovely nautical design features classic elements like a traditional wood table and chairs and brass chandelier, with a model sailboat sitting atop the nook’s bench. 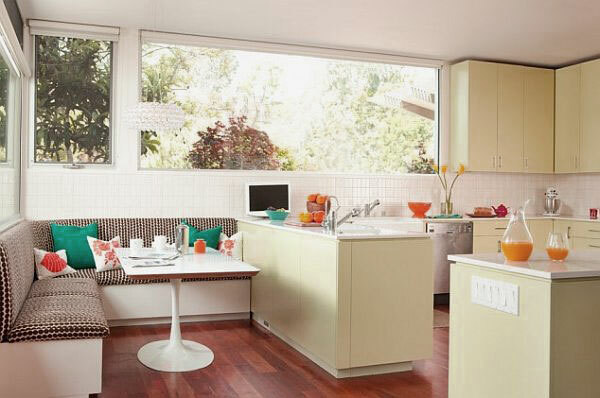 This back-to basics breakfast nook is for the modernist who prefers a minimalist take on life. 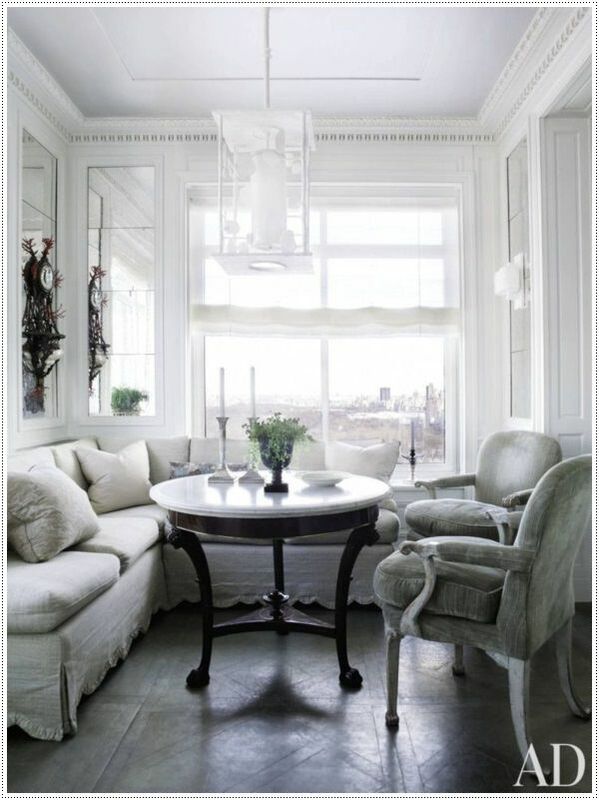 Design simply doesn’t get more simplistic than white walls, ceramic flooring, and a dome chandelier. 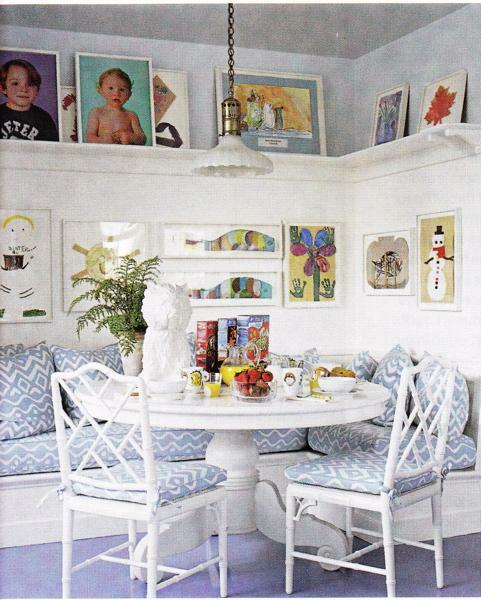 Mismatched chairs, vintage clocks, and wood paneling on the floor and walls contribute to the “shabby chic” ambiance of this light and airy breakfast nook. 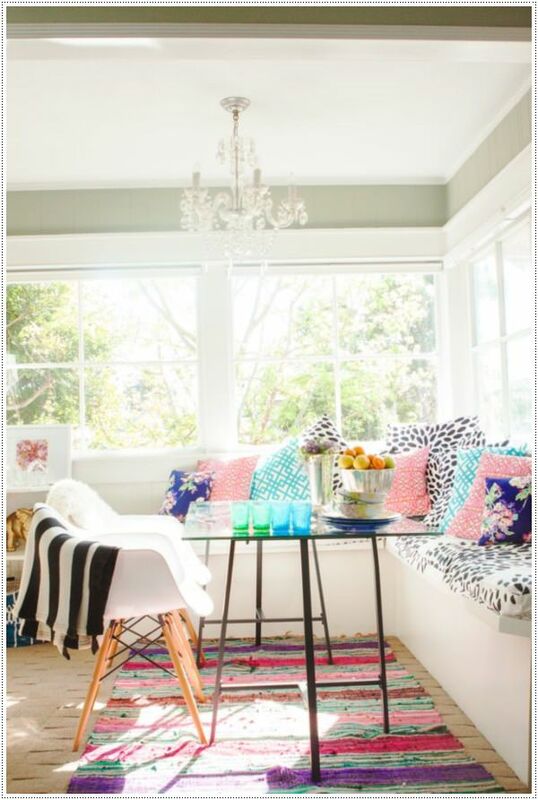 Pattern mixing is currently one of the hottest fads in fashion, and it certainly has a place in the interior design of your home. 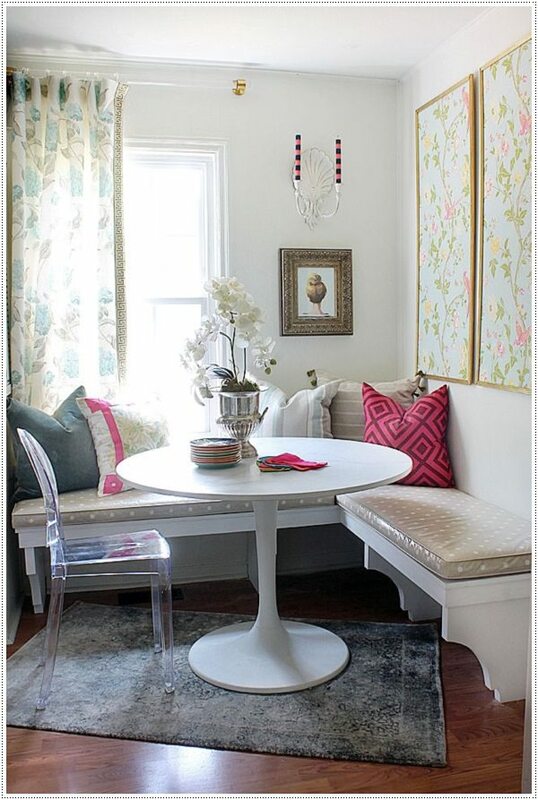 Add a splash of fun to your breakfast nook with contrasting prints and patterns on the textiles in your room.